Cape Town - Former Cheetahs flyhalf Kennedy Tsimba is not happy to see his former team participate in the PRO14. In an exclusive interview with Sport24, Tsimba said the PRO14 cannot be held in the same regard as Super Rugby. The Cheetahs and Southern Kings joined the European competition in 2017 when they lost their Super Rugby status. “I haven’t really bought into the idea of the Cheetahs moving to that competition. I think the PRO14 is a B-rate competition because you don’t see the top players from the likes of Munster and Leinster released to play in that league. Only when they play in the European Cup, do you see all their top players. It makes a statement in terms of how they see the PRO14,” Tsimba said. 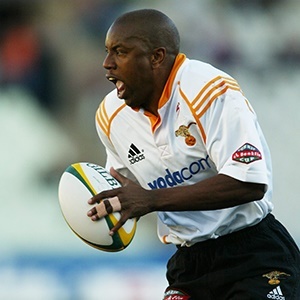 The 44-year-old Tsimba, who played for the Cheetahs between 2000 and 2005, also has his reservations on whether the PRO14 benefits South African rugby. “Whether it’s bringing financial benefit, the Cheetahs will know in the long run, but the crowd attendances haven’t been impressive. Is the PRO14 benefiting South African rugby or is it costing us more money? And how many players are we developing? “The Cheetahs always used to develop players some of whom went on to star for the Springboks. However, if I look at the current team it looks like they are trying to get numbers to survive in a competition that doesn’t really enhance South African rugby from my point of view."